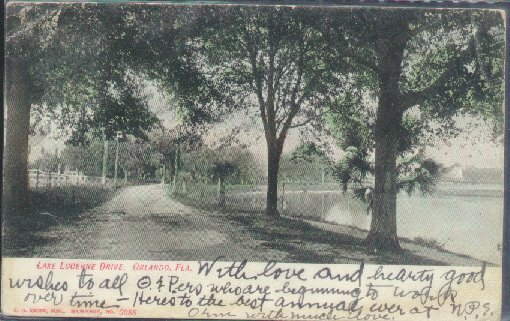 "Lake Lucerne Drive - Orlando, Florida - 1907." (1088) POSTCARD: Lake Lucerne Drive - Orlando, Florida - 1907. - Condition: Good. - Black and White Photo. Posted. Message written on the front. Back side was for address only. Lucerne drive was a dirt road at this time. There are 2 corners with creases. Price: $3.00 + shipping.